Last weekend, fully three months after the triple disaster stuck Japan’s east coast, I was part of a team of 15 from our company to join some of the volunteer cleanup efforts in Iwate prefecture, one of the three prefectures which bore the brunt of the tsunami. It was coordinated with Tonomagokoro.net based out of Tono City, Iwate prefecture. There was a few things we needed to sort out first, volunteer insurance, and where required, a tetanus booster. The insurance cost 1,400 for a year, and just involved filling some forms in, paying at the post office, then getting it checked and stamped at a volunteer centre in Tokyo before we left. Most volunteer organisations wont take people without this insurance. I also got myself a tetanus booster, since I hadn’t had one for a long time – they cost about 3,500 yen in Tokyo, and you need to ask for ‘hashoufuu tokisoido’ (破傷風トキソイド) and get it about two weeks before you go for the best coverage. Also, if you just say ‘Touhoku Volunteer’, that seems to work too. Due to our schedule, we left Tokyo on a mini-bus at 10pm on Friday night, and stopped a few times en route, before arriving in a wet and relatively chilly Tono City just before 5am, giving us time to unload some things, before the official morning wake-up call at 6am. The facility was a community sport centre, which now gave it’s sports hall and most of the building space to the volunteer efforts. Once we we allowed in, we changed into the work gear, got our name patches, which had to be displayed at all times, and got our documentation checked, before the morning exercises and announcements got under way just after 7am. Since it was raining fairly heavily, this happened in the sports hall once all the sleeping mats and such were cleared away. The announcements introduced the key members of the facility, many of whom would be point people at the sites. It was easy looking at them to believe that many, just four months ago, were likely just average paunchy bureaucrats, working in Japan’s huge local government machine. Now, here they looked focused and weather beaten. The main speaker was a wiry, hard spoken man, who looked almost military. 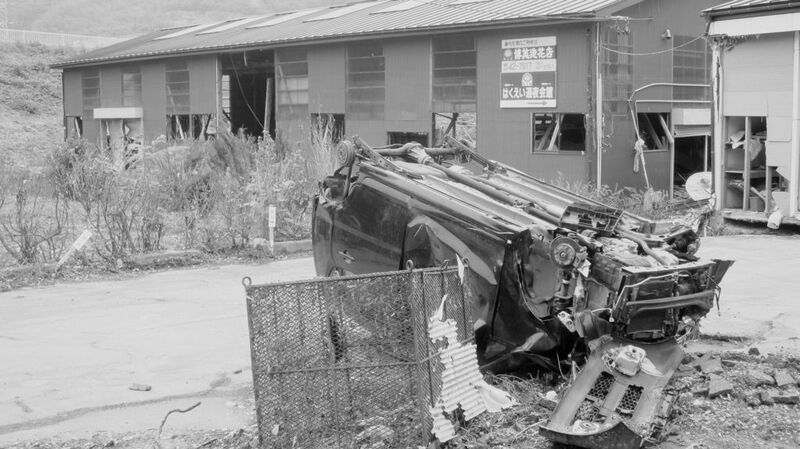 Perhaps poignantly, as he went through his safety preparations section, the building was hit by an earthquake rated at 5.1, shaking the sports hall for about 15 seconds, which sort of underlined why we are here – it’s far from over in Iwate. Safety is definitely the number one word here – everyone must have at least the basics before they’re even allowed on a bus to a cleanup site: face mask for at least dust (must bring several if basic), a helmet, some eye protection, and a safety insert sole for boots – basically a 0.75mm steel foot inset in case your step on something, to stop it going through your foot – and some hard wearing rubber gloves. Everyone was also told to take plenty of liquids and lunch, since as they’d be in the tsunami zone, there aren’t any supplies there. It’s this drive for safety which seemed to irritate some volunteers, but from speaking to the supervisors, they were very worried that even one volunteer could get hurt. Because of this, our first day perhaps didn’t give us the impact we were hoping for; despite the lack of sleep on the bus up, surrounded by probably 150 other volunteers, and others arriving in cars and on coaches for the day, we were raring to go. 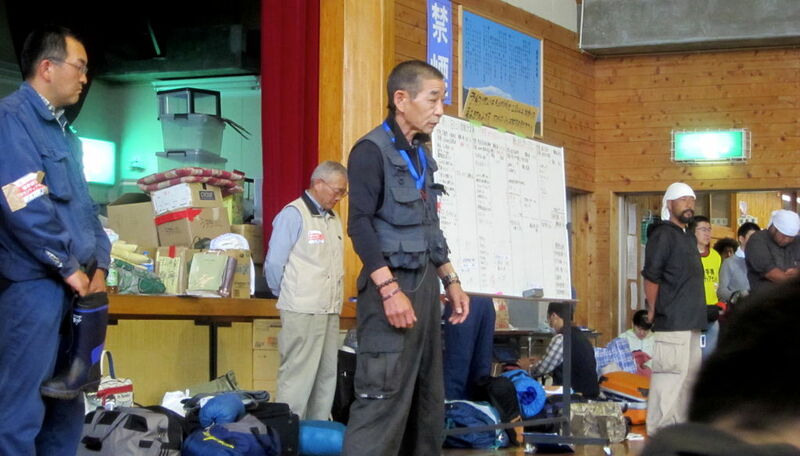 The Tono facility, whilst being a volunteer sleeping area is also a main staging and organisational post for a lot of the volunteer efforts in the region. There’s a lot of team spirit building – doing warm up exercises together – even giving each other a quick should massage, and all holding hands, and it really works – it builds on what is a shared purpose. They do make one point which is to not take photos unless you ask permission on site, and then only quickly and without setup or anything. They discouraged SLRs and larger kit. Photos from the buses were OK, but on site to be respectful of those still living nearby, and of course the sad fact that the whole tsunami area witnessed the deaths of over 15,000 people, with 8,000 still missing. Truthfully, in 2 days I think I took 8 photos on site, and some video from the bus. It’s just numbing, and looking at the footage doesn’t really capture the scale. The team leaders then divided volunteers into groups and assign work tasks for the day; sometimes they let groups choose, depending on the preference, or the capabilities of the group. People alone in groups can just latch on to other groups, and the atmosphere was very inclusive. I can’t cant the number of people who came over for a chat, to talk in English or trusting on my (not great) Japanese for a few words. Sometimes it was about why we were there, sometimes it was about why they were there, and sometimes it was about a random subject. I spent fifteen minutes talking to sixty year old man from Kobe in Japanese and English, partly about the clean up, but mainly about rugby; on the Saturday night I spoke at length to a few people about motorbikes, and the challenges of riding from Osaka to Tono – and the answer is ‘it’s very challenging’. Once we were ready to go, we gathered some food and water in some plastic bags, and in the now heavy rain, got onto a 20 seat bus for our first assignment. It’s vital to say you must take your own food and water – there’s not really any available at the centre, and obviously none on site, so make sure to bring some, or to go to one of the local convenience stores. The bus journey took over an hour, out to the coast. We stopped in a beautiful valley for a quick break, and had some of the best omochi (sweet rice paste) I’ve ever had, before getting on the bus again; this is one of the most beautiful parts of the world. Then we drive on, and around a corner, and there it is. Or rather, there it isn’t. There’s some surreal invisible line between a house still standing and looking relatively untouched, and then, twenty metres on, there’s just debris, overturned cars burnt out and just mud. Everything was coated in a sick looking grey mud. 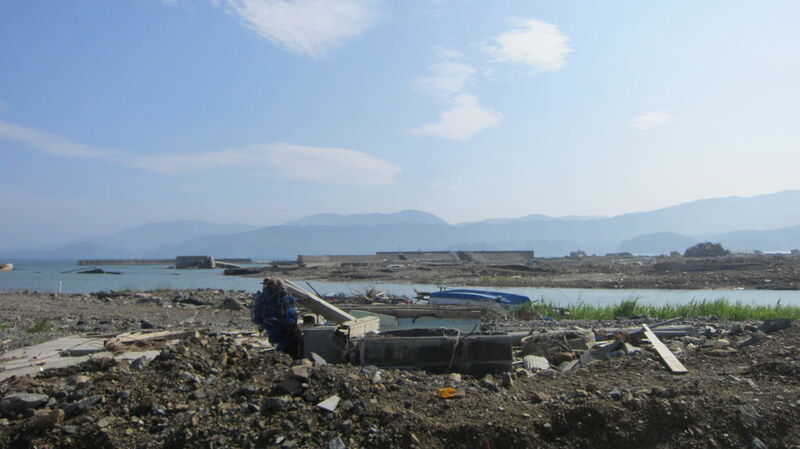 There were some tops of houses, smashed rice fields, and more of the mud. The bus bounced along, the roads relatively clear for most of the journey, but somewhat buckled in places. Much of the area we passed had been addressed so that much of the debris was piled up, awaiting the massive cranes and earth movers to put it on trucks to take it somewhere. It’s hard to describe. We pulled up on a hillside, and as the rain came down the smokers got out for a quick smoke, and a few more of us got out despite the rain to stretch our legs, and looked out over what was once fields and houses, to the ocean perhaps a kilometer away. Due to the heavy rain, the team leader was wary of letting us work around here, even just to pick up the smaller debris as it was all rice fields and the tsunami mud. After a short time we got back on the bus and he announced we’d work at another site higher up, on an old railway line. As we moved across this landscape, we could see the railway track by the side of the road, or rather, some of it. It disappeared under mud and debris for tens of metres at a time, and when we could see it, the erosion under the rails made the rails sag. One positive note though was a shining row of new power lines which crossed the valley, a reminder that things are moving forwards, albeit slowly against the scale of the tsunami. We stopped on the slope of a hill and all got out, to join a group of about fifty others, the job: clean all the detritus off the remaining railway line, and the embankment, and stack it all up for trucks to gather later. We also discovered that it would mean digging out the drainage trench which runs with the line, jammed as it was with mud, stone and debris. In the rain, we found it at least cool, but as the sun came out and the temperature moved over 25degrees, it’s important to keep water available. Sometimes you lose track of the situation, clearing anonymous bits of rock, twisted wood and such, but then you find those human things in the slurry: a bottle of pills, some smashed green tea cups, a ramen spoon, a roof tile, and inevitably sadder, a children’s toy, or a book. We also found quite a few shellfish, a reminder of how this happened. Everything seems to be a part of something – a house missing a roof, steel stairs leading to a bridge which has been ripped away, a steel frame for a three storey building with all the concrete removed and smashed down on a house hundreds of metres away. After a couple of hours we stopped for lunch, the groups all mingling and chatting, then another hour or so before the team leader announced that we’d stop at 2.46pm for a minutes silence. 2.46pm is the time of the Magnitude 9.0 quake which began this tragedy and I think quite a few of us had forgotten that today was the 11th, marking three months since that day; for me, three months since being rolled around in Tokyo on the 20th floor of the office building, and walking home for hours that night and the next day, and you realise that it was nothing compared to the three months people here have lived with, amongst the rubble. I remember a news report from that first weekend saying that coastal towns had been ‘erased’, but that’s not entirely true – erasure implied to me some kind of clean sweep, but this place looks like it had been repeatedly beaten into the ground, with plenty of evidence left to see. After some further clean up, it was back on the bus, and back to normality, through that jarring line, where the destruction stops, and normal geography begins. Back at the centre, we got changed, and though the place has some showers, we shared a taxi and went to a local sento about 15 minutes away, and paid 630 yen for 40 minutes cleaning and soaking. A sento is like an onsen, in that it’s a communal bathing place, but it’s generally not a hot spring source, so more like a wash house. It was a good place to just relax and think – we only did maybe four or five hour’s work, and maybe three hours on buses. We met quite a few jieitai (Self Defence Force – Japan’s army) members there, and I have to say, they were polite, and some even managed a ‘hello’s, though they generally kept to themselves in the tatami room within the building. We’d seen quite a few patrols around the tsunami zone, probably less about looting, and more for safety, visibility, and moving on people who we saw in their cars. After the sento, we went to a restaurant for yakiniku, and you’re reminded that even an hour away from the tsunami area, things are normal – food, power, business as usual. There’s a strict lights out at 10pm policy, and though we sat outside and spoke to people till just before 10, we made it inside, put down our sleeping bags, and prepared for sleep. 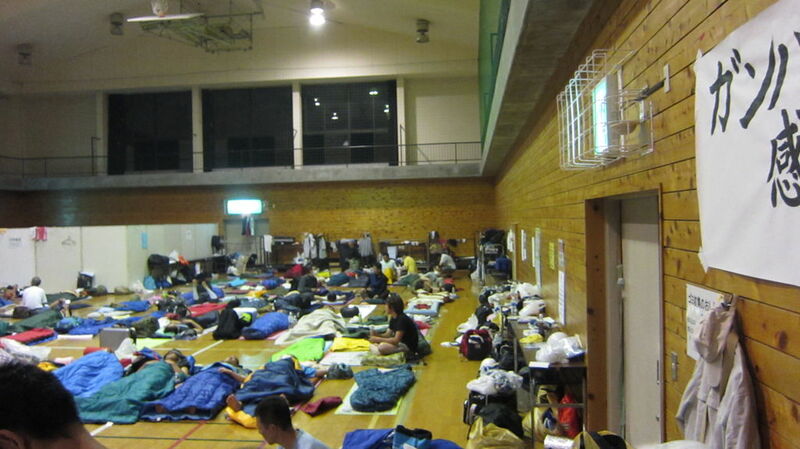 I should mention, the sports hall was for the men, and there were over 120 of us probably, so there was a fair amount of snoring; the ladies had the tatami room, which I’m told was much quieter. A floor for the night. Just for note, I would say about 30% of the volunteers were women, and their ages pretty much mirrored the men, from late teens to over 60. Morning wake-up bell is at 6am, tidy up the bedding, then it’s briefing at 7am, though since the weather was much better, we did it outside – it’s essentially the same one every day, so everyone gets the safety drill, exercise, and that shoulder massage. This time our bus took us somewhere else – to place called Sakuragicho, where we spent a few hours with spades and wheel barrows removing that grey, smelling clay from around a nice old lady’s house, before throwing more of the anti-bacterial powder down, and then a few hundred metres away, to a river bank, cleaning up more debris, and finding some photos, DVDs, video tapes, and placing them in a separate bucket, perhaps so that at some point family memories can be retrieved for those who survived, but lost others, or their homes and possessions. 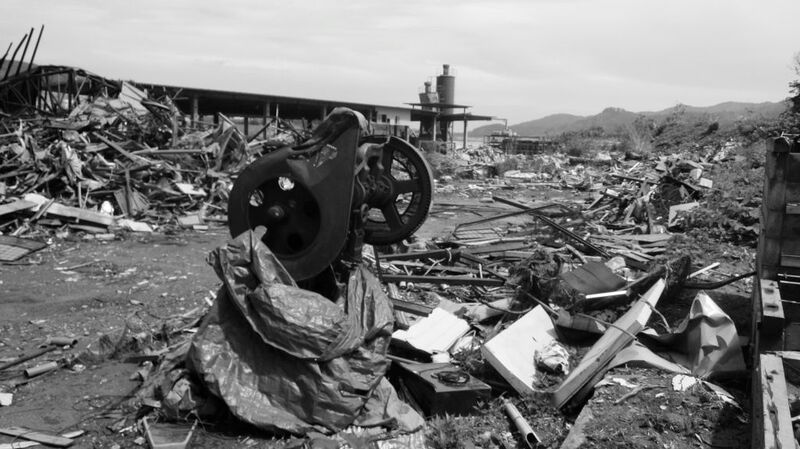 Around the river were signs of the tsunami still – a toilet ripped off from a house, angled into a ditch, the house itself in a car park; there were some upturned cars, stripped of wheels and fuel and oil, but left resting on their roofs until they can be removed. There are good signs though, and not just the few square metres of river bank we were able to clean up, a children day care centre which a couple of the team had worked on on a visit during golden week a month earlier when they were still digging sludge out from it, was now ready to be re-opened – all clean, with new lights and electrics – had it not been for the damage around it, it would look like any other children’s facility. After a couple of hours of putting rubbish into bags, it was back on the bus to the centre, and for us, another cleanup in the sento, a quick meal at a local sushi place, then back on the bus in the rain to Tokyo overnight, reaching our drop off at 5am. One thing that many of the volunteers I spoke to said, that was whilst the organisation was impressive, the goal wasn’t always defined – the ratio of hours on the bus and rest time to work seems disproportionate, and some felt that it would be better just to get professionals to do it. I think the sheer scale makes progress and goals difficult to see. The thing about the volunteering is quite layered: On a practical front, what volunteers can do really is a minuscule amount compared the the scale of devastation in the region; however, I think every little bit can help, and along with the keeping the problem in people’s minds, it can only be a good thing, and slowly but surely the region can be rebuilt, and hopefully be as beautiful as it no doubt once was, even just clearing a small stretch is one small piece if Iwate that doesn’t look ‘destroyed’ any more. Secondly, it enables those who just feel like they want to be here and do something to actually do just that, it also means they can go back and tell people what the situation is in Iwate, and the other tsunami hit prefectures. It also shows many of the locals that they aren’t forgotten three months on, and people care enough to come up and help. 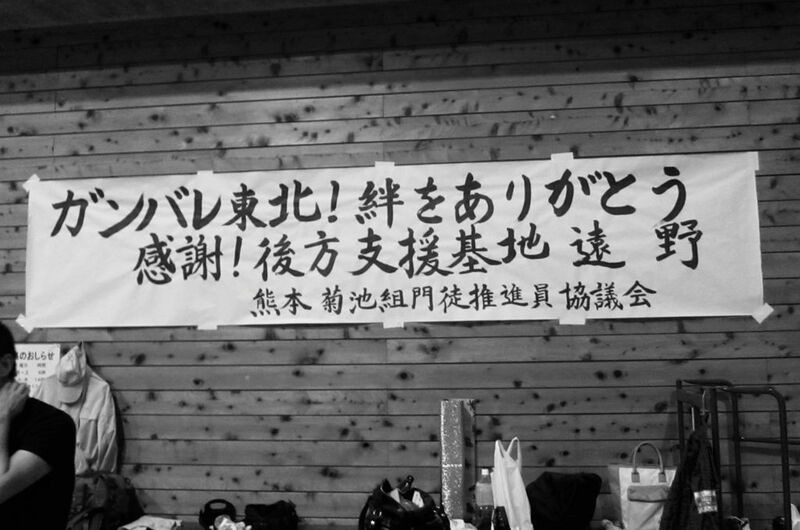 Against the international fear of radiation, and the Fukushima Daiichi plant in the media, the state and plight of the tsunami zones really don’t carry as much weight as they might across the country – volunteers might in some way be able to spread that news. I was struck by how friendly people were throughout the whole period – from people in the volunteer centre from all over Japan, some of whom were volunteering for a couple of weeks, and every night in that sports hall – to people at the sento, the restaurants, and out on site, everyone will to talk to anyone, and exchange ideas, options and commentary on the events, often asking the inevitable ‘Where were you on March 11th?” and whilst around the world the answer “Tokyo” might get raised eye brows, stood ankle deep in mud trying to get a roofing shingle out of that grey mess, it seems to have been one of the safest places to be. – Clothes – So you’re going to want some clothes! Some went for overalls, but as I have a problem fitting in the available overalls, I went for some old cotton trousers from my airsoft days, and a long sleeve shirt from Workman which did fit. I’d recommend something long sleeved, for general protection. – Eye protection – basic goggles should be fine – get ones designed for glasses if you wear them. Sometimes there’s a lot of dust. – Breathing mask – the bare minimum is the normal cold/hayfever ones sold everywhere, but bring quite a few. I went for a proper facemask with swappable filters. Also note, better masks also help with the smell – there’s a lot of sewage and dead sea life still around in places. – Boots – Rubber boots (wellingtons) were the most common footwear. After rain there’s a lot of mud, so you want something to keep your feet dry. – Safety sole inserts – you must also get a pair of safety sole inserts which look like normal inner soles for boots, but have a sheet of steel in there. This is to protect you against standing on something very sharp. They made a keep point of these in the presentations. – Waterproofs – We went in rainy season, so no surprise there was rain – they’re also good to have on your legs anyway to help keep you dry if you kneel down. Note though that cheap ones wont let sweat out, so on a very hot day, you may want to remove them. – Gloves – you’ll want some of the thick, usually blue rubber gloves – a pair of the general white ones may work, but it’s often wet and dirty, so the white ones don’t last long or offer much protection. – Helmet – a basic earthquake helmet from your kit is enough – the rounded plastic ones available in most home DIY shows nowadays. It’s just there to protect from dirt and items being moved around really, but it is beneficial to have with you. I got most of the above which I didn’t already own, from the local home center and Workman. Even with the things I did have, the cost was less than 10,000yen – for example: waterproofs: 600yen, face mask 2,500yen and so on. The volunteer station will have some spares, donated by previous volunteers, but please don’t rely on it – take your own. – bring some towels – to dry off and also to use at the showers / sento. I don’t think any are provided. – plastic bags – to carry your stuff around in on site, and for rubbish, dirty gear and so on. – food & water – the only thing available at the center is hot water for cup ramen, and that’s it, and nothing on site, though there are several 24hr convenience stores near the facility. – sleeping bag and ground mat – again, get cheap simple Coleman ones unless it’s winter. Sports hall floors are very hard and flat. Having food and liquid with you is essential – when it was hot, and you’re losing a lot of liquid, that 500ml PET bottle wont last long; I took my CamelBack and was pretty much getting through the 2 litres on site each date.